With very limited wall space in our house, it’s important to us that everything that goes up has meaning and brings us joy. I had replaced a really blah sign on our mantle over the holidays with something I created and loved. But since it said “silent night, holy night” it wasn’t a good fit all year. So when Project Studio invited some friends and me to come to their newest location and make a creation, I knew I needed something less seasonal for my mantle. 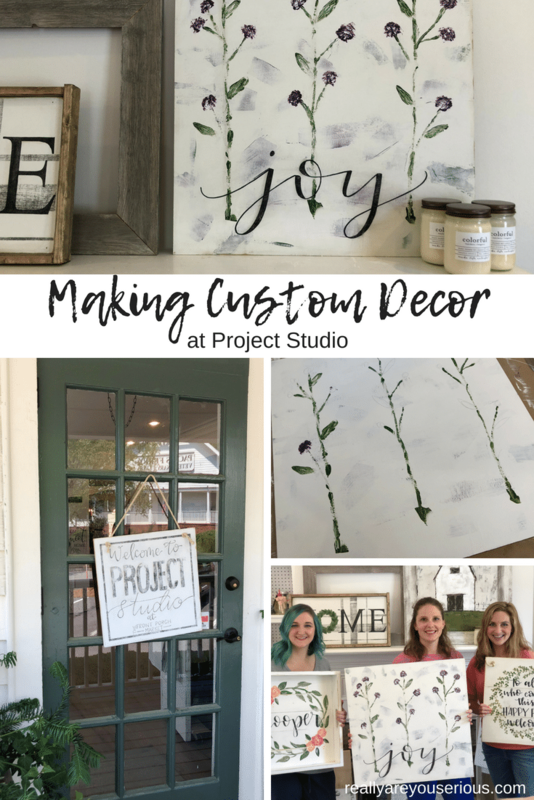 When I walked into the newest Project Studio Vinings inside Front Porch Market, I was immediately inspired by a purple flower sign and knew I wanted something with them. Upon entering their newest location, you can’t help but smile at the outside decor. To the right of the door is a great porch swing that just screams for somebody to sit on it with a nice iced beverage. Inside you will find a ton of other projects to inspire you and give you ideas. The open sessions really allow you to make almost anything they offer or something of your own creation all together. Once I decided on my flower sign (see the video), I had to learn the technique for the background. 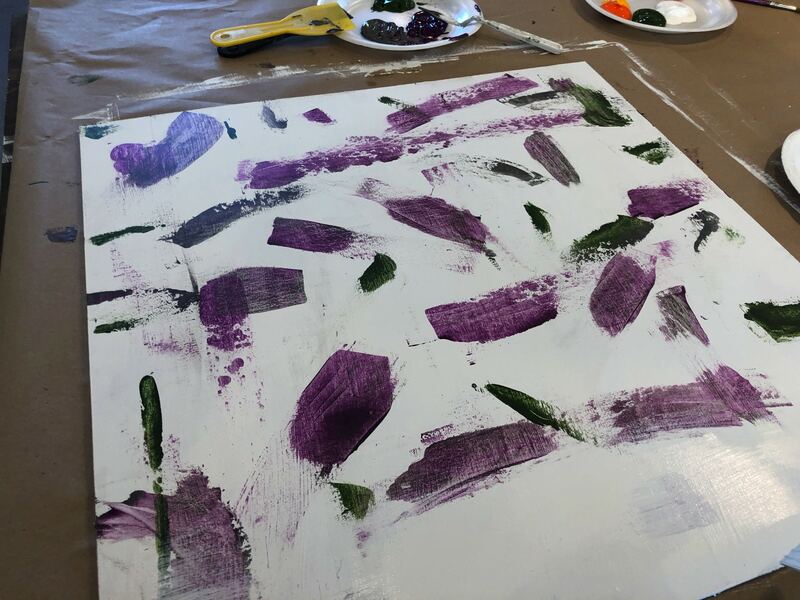 Basically, I had several different tools with different shapes that allowed me to smudge and swipe a couple different colors all over my newly white painted board. Yes, I had to paint it white only to paint over it. But, I learned a fun technique that I’m told pretty much anybody can make look good. Once that was dry, I painted over the color with white. Yes, there are a lot of layers here. I then had to dry the white layer (there are hair dryers readily available). And then it was sanded to reveal some of the coloring on the background. There are a couple instances of painting and sanding throughout the process. Maybe we waited to sand once the flowers were painted. Thankfully, they take care of the guidance and directions so you can’t mess up. 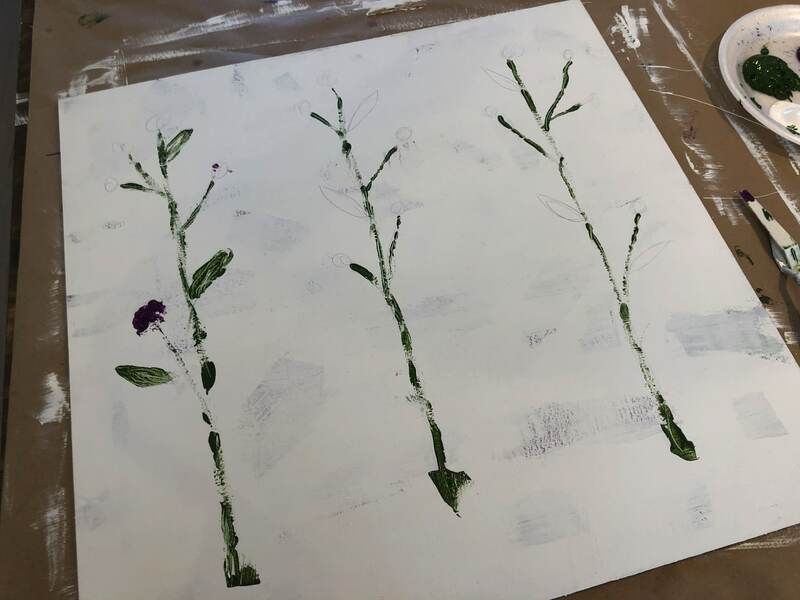 You can see the outlines of the leaves and flowers here to guide me in my flower and leaf painting ways. It was the same technique used on the background as well. Once the flowers and leaves were done, it was time to go back to the sander. Wimberly carefully took some of the white and color off to give my sign that shabby chic look. 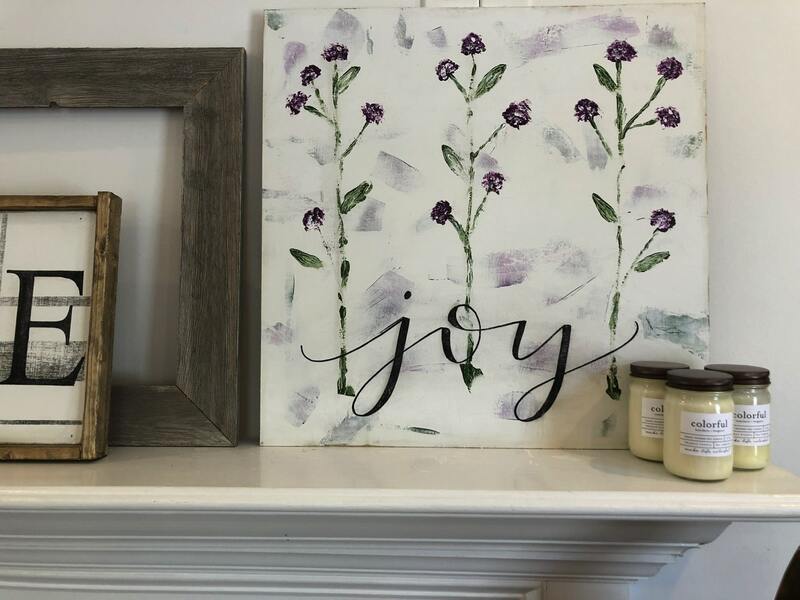 After that Wimberly hand-lettered the word “joy” on the bottom of the sign for me, just like was done on my serving tray with hand-lettering a few months previous at the first Project Studio location. After she wrote it nicely, I was instructed to paint in the spaces and make the “joy” complete. My friends Meghan and Lindsey both spent time making custom decor for their homes and gifts with Meghan making a serving tray for her mother in law and Lindsey making a Disney door hanger (can you find the hidden Mickey?). Honestly, the sign by itself is really great and definitely a look I was happy with, but I found out that they also included a frame with my desired stain color on it. The only bummer was that at the time, they didn’t have the frame there so it had an extended vacation at the other location to get a frame on it. But now the final project fits on our mantle perfectly and I couldn’t be happier with my custom decor. 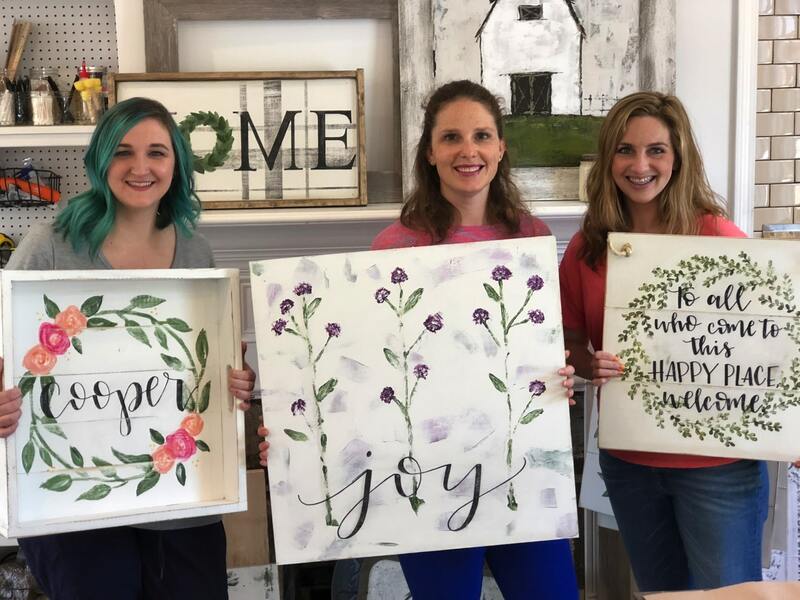 In addition to these projects, they host coffee and painting classes, hand-lettering classes and even kid workshops and parties. 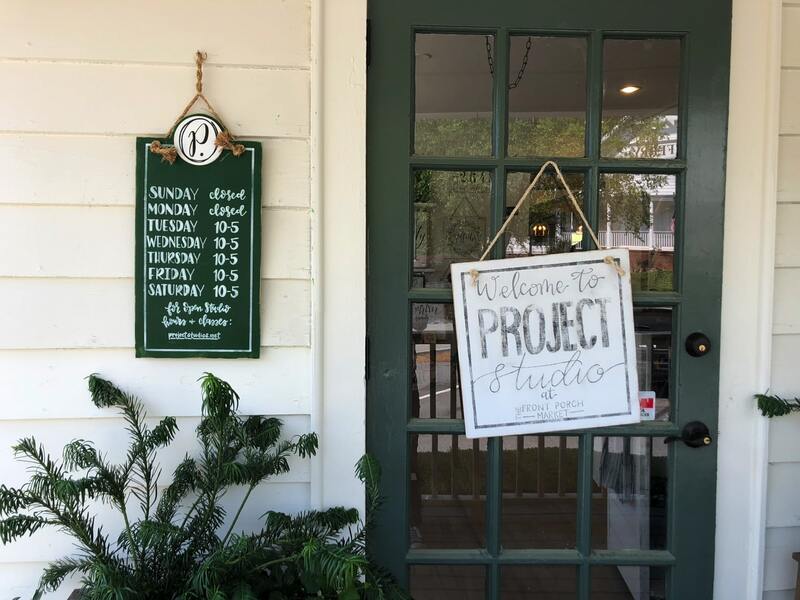 If it can be painted or created, Project Studio will help you do it.